Tuck your wish or intention inside this handmade beaded bracelet to carry it with you. Shooting stars. Birthday candles. Found pennies. The perfect moment to make a wish doesn't have to rely on chance. Hidden within this bracelet's clasp is a secret compartment to stash your personal wish - whether it's a daily intention, a meaningful reminder, or exactly what you've been wishing for. Simply write your wish on a tiny bit of paper (a set of just-the-right-sized sheets is included), roll it up, and tuck it into the opening. Wear it as a daily reminder to keep at it and stay focused on your goalbecause putting what you want out there is the first step in making your wishes come true. Made in China. I pray everyday and put my greatest prayer concerns in the bracelet. My bracelet reminds me throughout the day to pray for my intention and to offer up my daily tasks, trials, and successes for these intentions. I am glad that you offer so many colors AND this new 'secret compartment' bracelet. It's a small piece of jewelry with a big meaning behind it. Everytime I look at the bracelet I get a constant reminder to stay motivated and work hard to achieve my goals. The bracelet is pretty durable and is unique in style. I bought this as a gift but would love one for myself. My friend wears it all the time. To yoga class and everywhere. This bracelet was purchased as a gift for a dear Aunt who has been like a mother to my husband. She is a goal-oriented, hard-working woman who has been through some very rough times. She loves setting goals for herself and making them happen. She also likes jewelry. 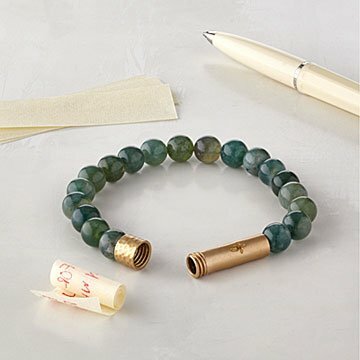 I knew this bracelet was perfect for her as soon as I saw it, and when it arrived I was pleased with the beautiful stone beads and workmanship. It is a lovely, unique piece that I'm sure she will enjoy wearing and stowing meaningful phrases or goals, reminders, or hopes inside! My partner wears it each day. She said it fits perfectly. She thinks it is beautiful and can't wait to start having her wishes and dreams come true. I got this as a gift for my cousin. It's really beautiful and packaged nicely for a gift. It's unique without being odd or weird. It has a purpose. It brings daily happiness.